Preseason capsule information for the area’s girls tennis teams, as submitted by coaches. Outlook: Peterson takes over a team that returns 10 letter winners and hopes to contend for a postseason berth. Outlook: Berg, who was half of the Wolves’ No. 1 doubles team last year, will play singles and hopes to help a young Basic team have success. “It’s a young team with not a lot of experience looking to compete for a spot in the playoffs,” Black said. Outlook: The Bengals return only four letter winners from a team that qualified for the Sunset Region playoffs last year. “This year’s collection of athletes will undoubtedly have success throughout the season,” Brooks said. “There is potential for the established players to bring the rest up to another level through example and their leadership capabilities. Outlook: Tegan Pappas finished third in the Class 3A state singles tournament last year and leads a group of eight returnees for the Eagles. “We expect to be stronger this year and feel confident that we have a very good chance to advance to the state playoffs,” Jami Pappas said. Outlook: Fukuma takes over a team that brings back three letter winners and hopes to show improvement during the season. Outlook: Boch-Collins won the Class 4A girls singles state championship last season and is one of 10 returning letter winners for the Chargers. “We expect to go to playoffs this year and hope to send more players to state,” Angelov said. Outlook: Rodriguez was a second-team All-Sunrise League honoree last year and is the lone returning letter winner for the Dragons, who hope to show improvement throughout the season. Outlook: The Sundevils return five letter winners from a squad that finished second in the Northeast League. “We will be very young and inexperienced this season,” Medellin said. “The girls put in a lot of work this summer and look to gain much needed experience for the future. We will be led by seniors Heather Holman and Jessica Samano-Ramirez, who earned a berth in the Sunrise Region doubles quarterfinals last year. Outlook: Graduation hit the Crusaders hard. Nine seniors who combined for 680 career victories and led the team to three state finals and one title have departed. The cupboard, though, is far from bare. Nine letter winners return and the Crusaders welcome back Mayweather, who attended Faith Lutheran Middle School before playing at Bishop Gorman two years ago. Mayweather advanced to the Sunset Region quarterfinals in doubles two years ago for the Gaels. Barr (34-5) and Stadtlander (30-8) both were first-team all-league selections last year. Outlook: The Falcons bring back five letter winners from a team that qualified for the playoffs. “We have an interesting mix of both experience and inexperience on this year’s team,” Iglitz said. “We have potential, but we also have a long road ahead of us as a team. Our five returning lettermen have all played a significant number of high school tennis matches, however we also have several players not only new to high school tennis, but new to the game of tennis. Outlook: The Longhorns are hoping to contend for a postseason berth again this season. Outlook: The Patriots came within an eyelash of winning the Sunrise Region title last year, falling to Coronado in a tiebreaker in the region final. Knoblock, a state qualifier in doubles and a first-team all-region honoree, and Whited are the only two returning letter winners for Liberty, which hopes to find some depth and compete again this year. Outlook: The Mustangs graduated a large senior class that helped the team win the last two Class 3A state titles. The Meadows has won four state titles in the last five seasons and hope to remain one of the top programs in the state. “We are hoping to go all the way,” Prandecki said. Outlook: Numbers were the main problem for the Rattlers last year. With five returning letter winners and some new faces, Mojave will be able to compete as a team this year. Outlook: The Panthers return 14 letter winners after winning their third consecutive state title last season. Outlook: Cernak takes over a team that returns five letter winners. “The Rams have several returning players who are looking to lead the team through our regular-season matches and into the playoffs,” Cernak said. 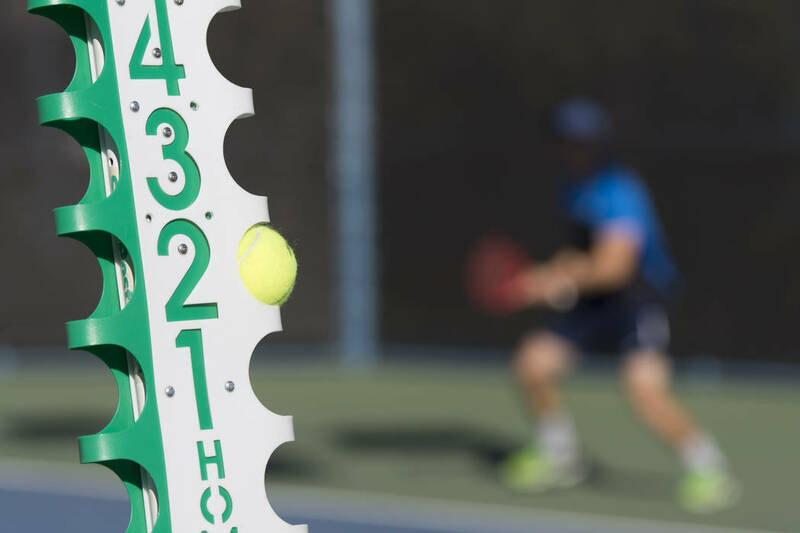 “Beyond becoming better at playing tennis, the girls are also hoping to improve their grit, zest, optimism, and teamwork abilities to improve as players, students, and people. Outlook: Andrada Stanciu won the Division I-A girls singles title in 2015 and narrowly missed advancing to the Class 4A state singles tournament last year. She has the potential to be one of the top players in the Sunset Region and state again this year. “We expect to compete for a playoff spot,” Ulrich said. Outlook: Ciarlo leads a group of nine returning letter winners who hope to help the Skyhawks improve this season. Outlook: The Vikings bring back six letter winners from a team that finished first in the Northeast League last year. Laizure was a first-team All-Sunrise Region honoree last year, and Jianu, Angelov and Angel all earned second-team all-region honors. “We hope to improve every day and be competitive in the new Sunrise League,” Barney said. Outlook: The Bulldogs lost some key seniors to graduation and are hoping to recover quickly. Outlook: From having only one player on the team in 2013 to qualifying for the Sunset Region tournament last year, the Warriors have made huge strides. They’re hoping to continue that progress this year with three letter winners returning.